How do I view/pay my account online? How can a parent or guardian have access to my billing account? Non-student payers who have been authorized by a UNA student may view and pay a student’s bill on their behalf. Authorized payers can only be established by the student. UNA cannot establish an authorized payer for the student. Authorized users will first be prompted to log in to a secure site with the appropriate ID and password combination. The authorized user you have specified will receive an e-mail notification which contains initial E-bill password and login instructions. An e-mail notification will be sent to each address provided when a new E-bill becomes available. Log in with your e-mail address and the initial password provided in your E-bill welcome message. If you have logged in before, you will use the password you selected upon first login instead. Electronic Billing (e-bills) is the official means of providing student account statements to all current UNA students. When a new bill is available an e-mail notification will be sent electronically to the student’s UNA Portal e-mail account and any Authorized Users established by the student. Students are advised to check their e-mail regularly. Can I have my bills mailed to me? Electronic Billing (e-bills) is the official means of providing student account statements to all current UNA students. When a new bill is available e-mail notifications will be sent electronically from Student Accounts to the student’s UNA e-mail address and any Authorized Users established by the student. You may obtain a paper bill by accessing your E-bill and printing a paper copy of your bill. Within the E-bill account, a student and authorized individuals can make online student account payments with an electronic check (e-check) or with a credit card (VISA, MasterCard, and Discover). The option to pay by e-check and credit card are available online or in person only. 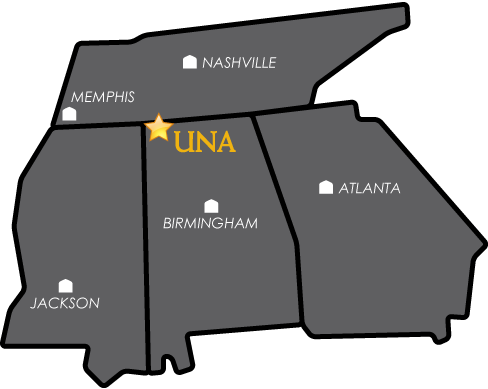 Does UNA offer a payment plan? UNA offers an interest-free monthly payment plan through a commercial provider for the Fall and Spring semesters only (see the website at http://www.una.afford.com). How do I report non-UNA scholarships, employer education plans, state benefits, etc. to UNA? External Scholarships from schools, churches, organizations, etc. - Students who are receiving an external scholarship should have the checks mailed to the UNA Business Office. Be sure that documentation (e.g. Employer Vouchers, GI Dependent, Voc. Rehab., PACT) and checks (Scholarships) are submitted to UNA before the payment deadline. Please remember that payment of amount due is always the student’s responsibility. I need additional information. How do I contact UNA? To contact the Business Office, you may call 256-765-4442 or call 1-800-TALK-UNA and ask for extension 4442. To contact other departments, visit the online departmental directory.